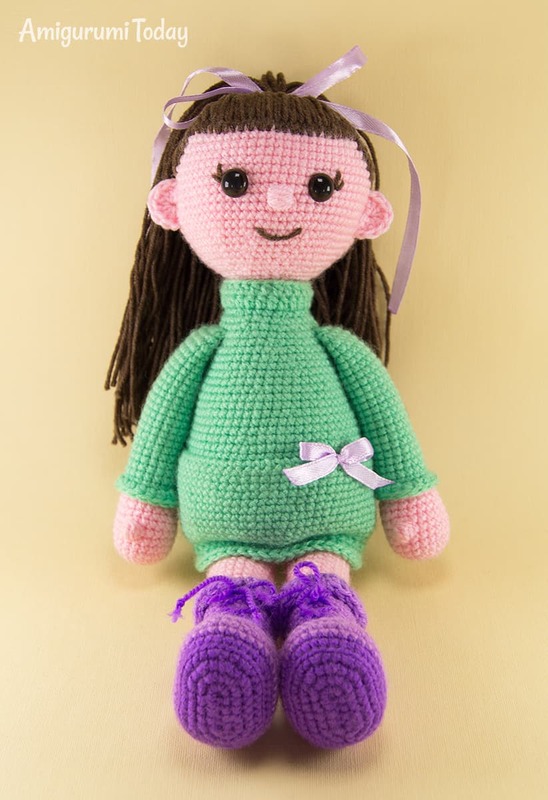 Meet Lulu, a lovely crocheted doll dressed in stylish green tunic and bright purple boots! 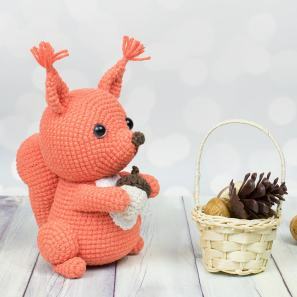 This amigurumi doll is perfect for play activities and room decor. She will be a friend for life! 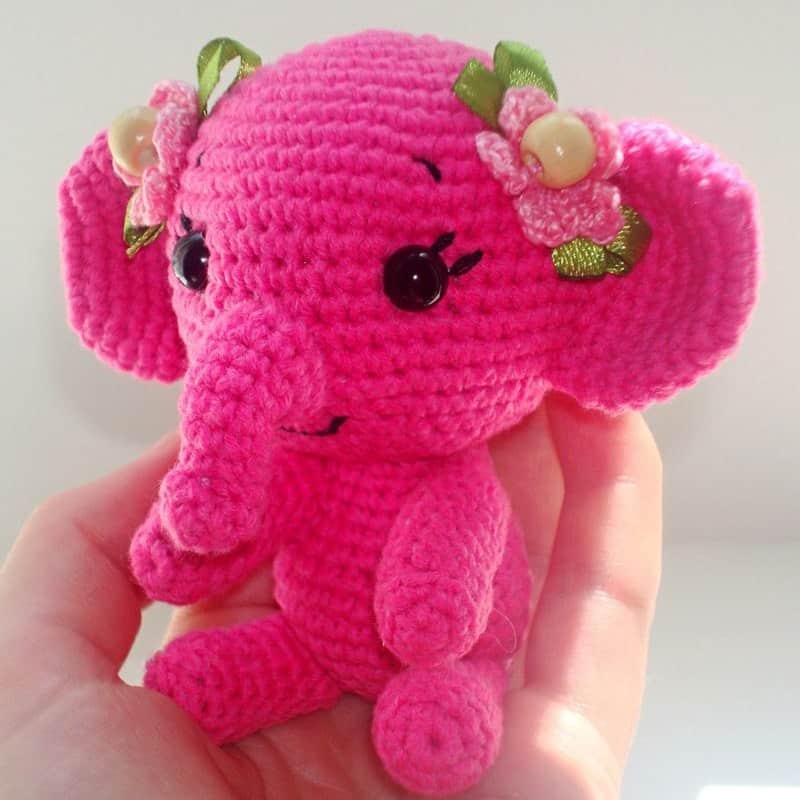 The size of the finished amigurumi doll is about 26 cm (10″), if you use the same hook size and yarn weight. How to crochet bobble stitch: work 4 dc, all into the same stitch, leaving the last loop unworked on the hook each time. When you have 5 loops on the hook, yarn over and pull trough all 5 loops. 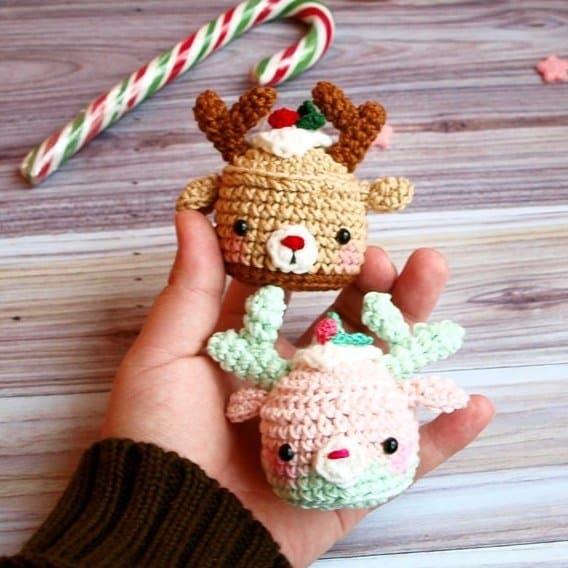 Start crocheting with brown yarn. Insert safety eyes between Rnd 19 and Rnd 20 (10 stitches in between the eyes). 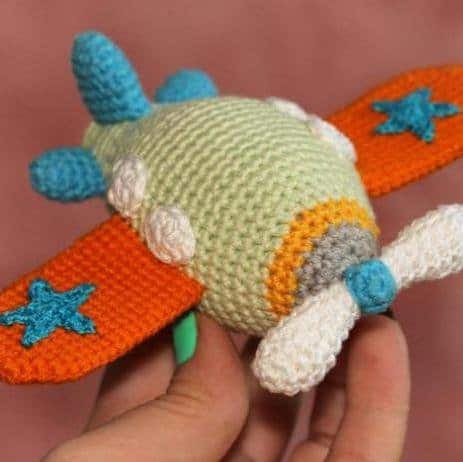 Crochet 3 ch with body-colored yarn. Rnd 1: 7 dc in the 3rd ch from the hook. 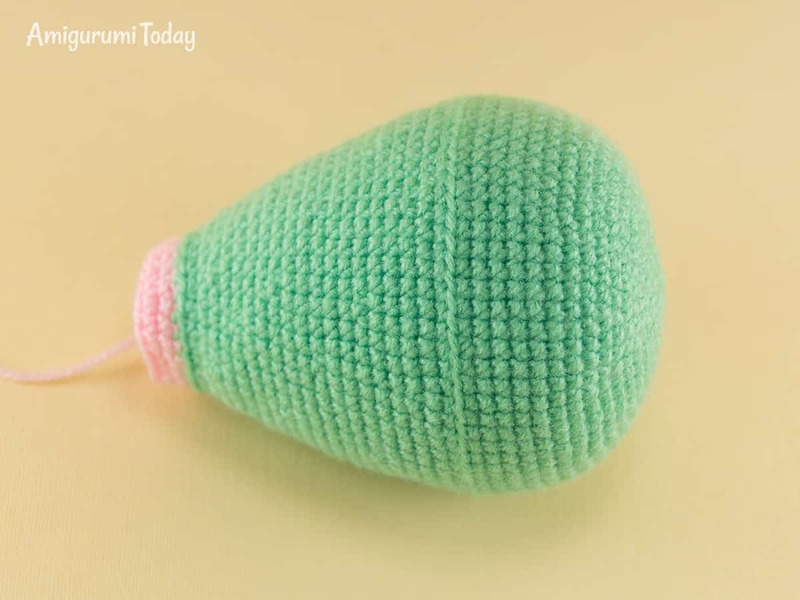 Crochet with light green yarn. Fasten off leaving a long tail for sewing. Stuff. 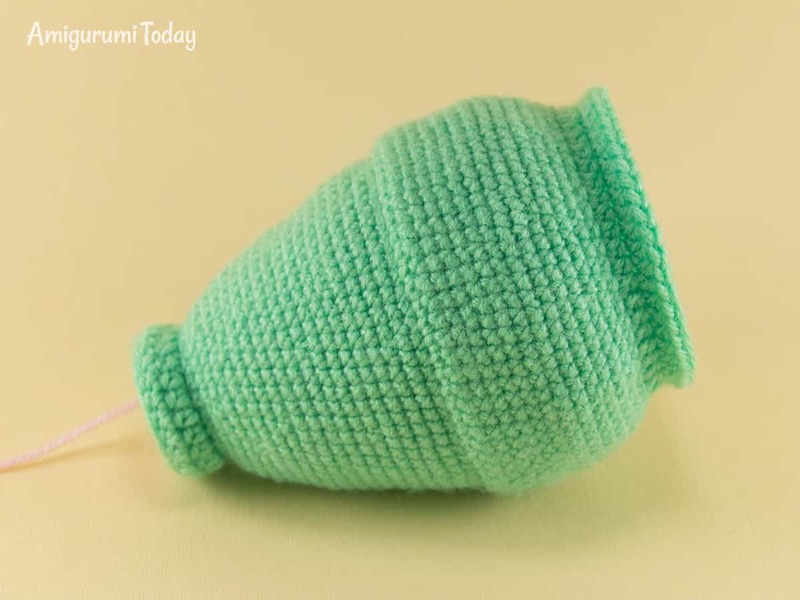 Join light-green yarn to one of the front loops of Rnd 37 of the body. Rnd 1: 2 ch, hdc in next 23 st, join with sl st.
Join light green yarn to one of the front loops of Rnd 18. Rnd 15-16: 2 ch, hdc in the next 49 st, join with sl st.
Change to light green yarn. Stuff the half of the arm with fiberfill. Flatten the upper part and crochet 7 sc through both layers in such a way that the thumb faces forward when the arm is sewn to the body. Cut off the yarn, leaving a long tail for sewing. Join light green yarn to one of the front loops of Rnd 12 of the arm. Rnd 1: 2 ch, hdc in next 17 st, join with sl st.
Crochet 6 ch with dark purple yarn. Continue crocheting around the foundation chain. 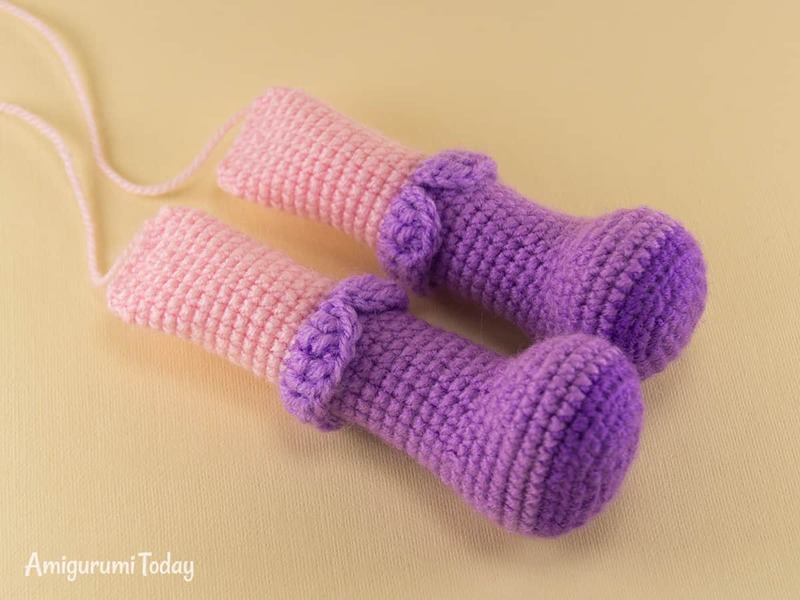 Change to light purple yarn. Stuff 2/3 of the leg with fiberfill. Flatten the upper part of the leg and crochet 8 sc through both layers. Make sure that the boot is positioned correctly in relation to upper part of the leg. Cut off the yarn, leaving a long tail for sewing. 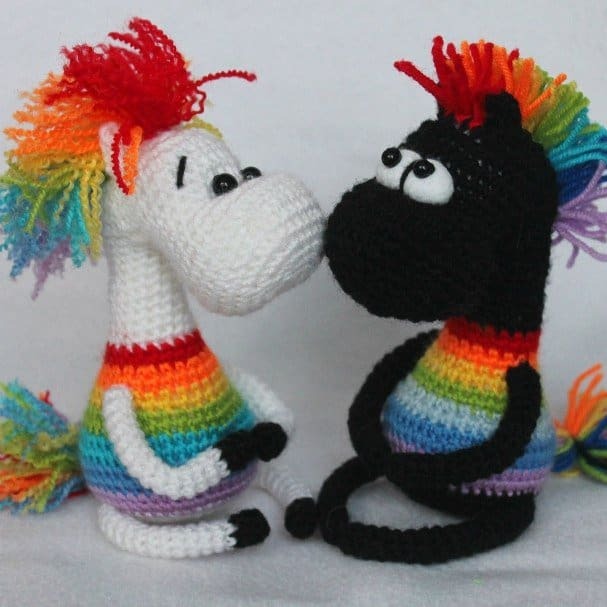 Join light purple yarn to one of the front loops of Rnd 24 of the leg. Rnd 1: 3 ch, tr in next 18 st, 3 ch, sl st in the last loop. 2. Sew on the arms at the level of Rnds 34-35. 3. Sew on the legs between Rnd 1 and Rnd 10. 4. Sew on the ears at Rnds 19-24. 5. Now you’re going to make hairs. Cut the yarn into pieces, each piece is about 45 cm long (17.7 inches). 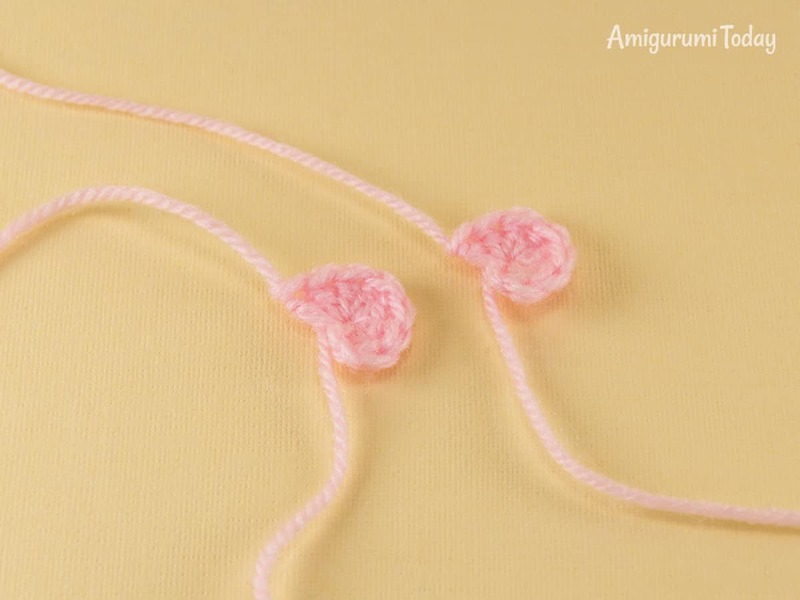 Fold the piece in half and draw the center through the stitch of the head with your hook. Pick up 2 strands, draw them through the loop and tighten. Attach all other pieces in the same manner, beginning on Rnd 12 above the face, gradually going down behind the ears and to the back of the head. Make a pony tail and tie it with a ribbon. 6. Embroider a smile, a nose and eyelashes. 7. Imitate the lacing on the boots inserting a piece of dark purple yarn. 8. Decorate the tunic dress with a ribbon. Hello. If I want to make the size 40 cm how I make that?? I am so happy find this, not difficult. easy understanding. Thank you so much. Please help me! I didn’t understand where and how the legs should be sewn. A picture would be helpful. Thanks! Can you tell me how to make sure the head stays upright as mine is so heavy it falls forward? 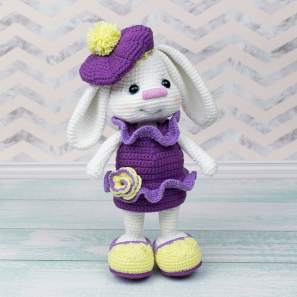 I have also purchased another pattern and want to make sure if there is a better technique to have the doll sitting upright I can do it. I love the doll I made! Hi Jenny 🙂 To strengthen the neck, insert 2-3 cotton swabs or round wooden stick in it (the upper part of the stick is in the head, and the bottom part is in the body). Add some fiberfill in the neck before you finish. Where do you find super fine acrylic yarn ? What brand ? Easy to follow tutorials, thanks. We call my g-daughter Lulu so I plan on making her one for her birthday as part of her gift… Thank you for posting it!! !